The Seneca Trail is our longest and most varied trail. It spans the Town from north (connecting with the Perinton Crescent Trail System) to and through Boughton Park in Bloomsfield in the south. A footpath for most of its length, it has hills to climb with long vistas, low-land boardwalks, bridges, and fords. (And, in wet conditions, some muddy spots!) It is named for the Seneca Indians who had a main trail from Bare Hill by Canandaigua Lake through Ganondagan to Irondequoit Bay at least paralleling our trail. At the end of LaSalle Parkway is the connection between our Seneca Trail and Perinton's Cresent Trail System. NOTE: There is no parking space on LaSalle Parkway; use the mall parking by Bed Bath & Beyond. This section and connection was opened in the Spring of '14. The trail goes through woods, by a small stream behind the mall. Then across lawn to the traffic light for crossing Turk Hill Road. Again on lawn to where it starts up the hill under the power lines in meadow. It then climbs the hill in woods to reach High Point. This section was opened Sept. '12. From the north west corner of the High Point parking lot, it goes along the west and then south edge of the lawn. Near the building, it turns down the hill to High Point Drive. After a short distance up hill along the Drive, it again goes down hill to Valentown Museum. The trail passes right behind the hall. Then to the Valentown Road and High Street intersection. This section of the Seneca Trail, as of September '16 has been cleared, but not yet finished. It is still missing a bridge (awaiting a funding grant), you must ford a small stream, and there is a switchback on a hillside. In June '12, a part of this section needed to be rerouted closer to the mall with WalMart and Kohls. Access from Fishers Fire House #2 has been closed. The trail continues at the traffic signal light on High St. by Valentown. It continues down the driveway to the pump station and goes through the woods and along the small stream toward NY96. It then crosses the stream (September '16 as a ford) and up the hillside. For a short way it parallels NY96 on the wide grass shoulder, then turns into the woods as it passes behind the small strip mall. At the south end of this mall, it turns to the east and follows the back of the large mall. The trail then continues south with some up and down. It is grass surface and mostly 4-foot wide. 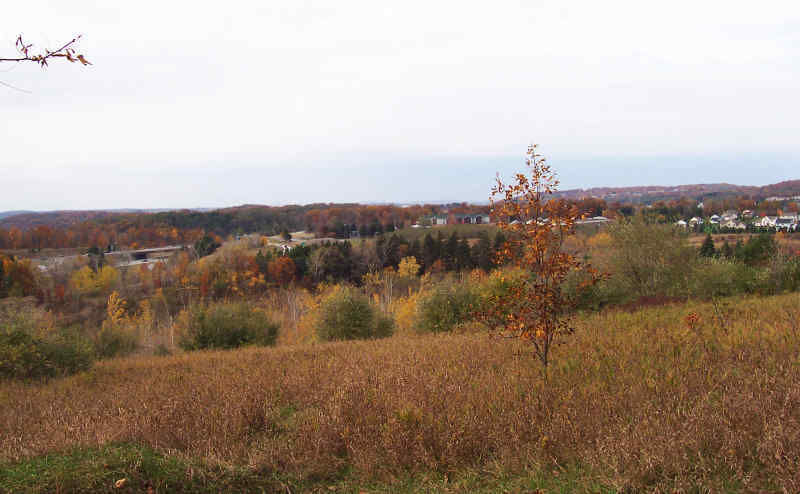 After a long climb it opens into meadow with views of the Irondequoit Valley and on to the city of Rochester skyline in the north and rolling hills to the south. After entering a wood and topping the hill, the trail winds down to Willowbrook Rd. 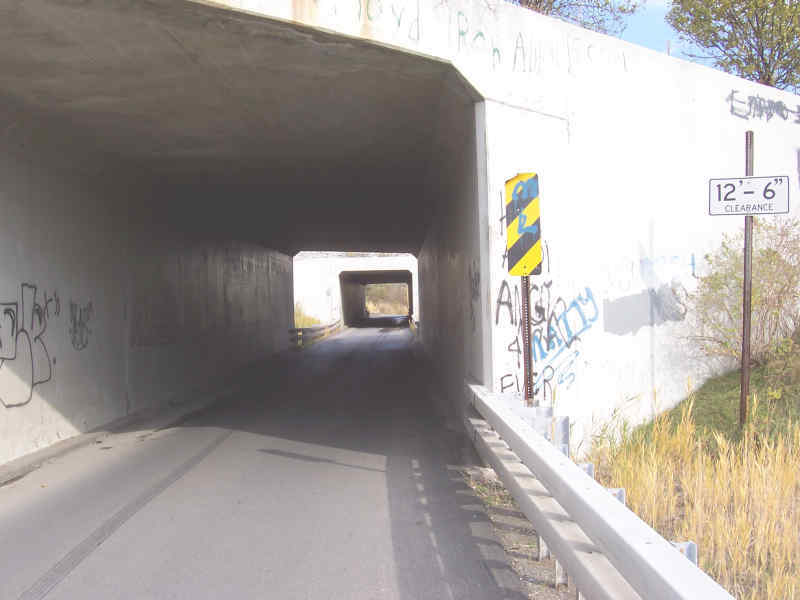 The trail passes under the Thruway with the single lane Willowbrook Rd. Walk to the left, facing traffic. The trail is mostly grass surface and 2- to 6-feet wide. There are two step-over fords in this section. 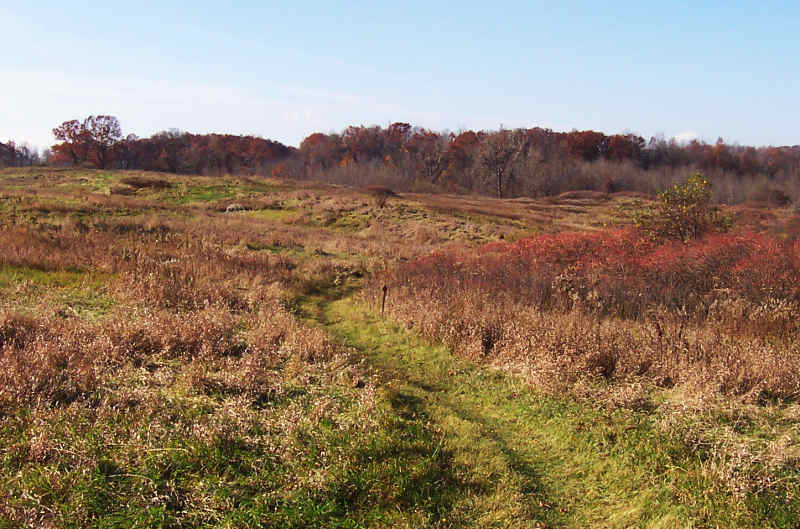 The trail parallels the Thruway and climbs to another open meadow. Again there are some long vistas. Then in a wooded section, it passes through a valley believed to have been the site where Senecas ambushed the invading French Army under the Marquis de Denonville in July 1687. 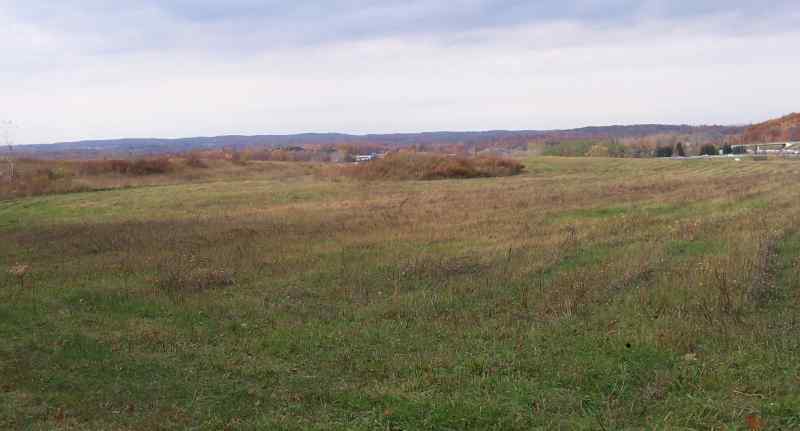 Note (Sept. '16): This hill top is scheduled for a major development, including a Bass Pro super store. The Seneca Trail will be rerouted at that time. 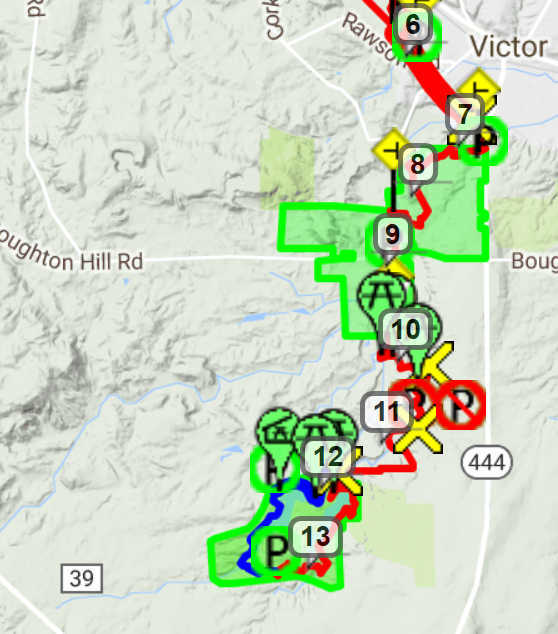 Both the developer, DiFelice Development - a very strong supporter of VHT and trails in other developments, and Bass Pro are supportive of the trail, and likely it is likely there will be more trails on the property. This is the roadside of the Victor Mendon Rd (NY 251). The Lehigh Trail goes west into Lehigh Crossing Park, just across NY 251. This section is lowland meadow, woods, and swamp. 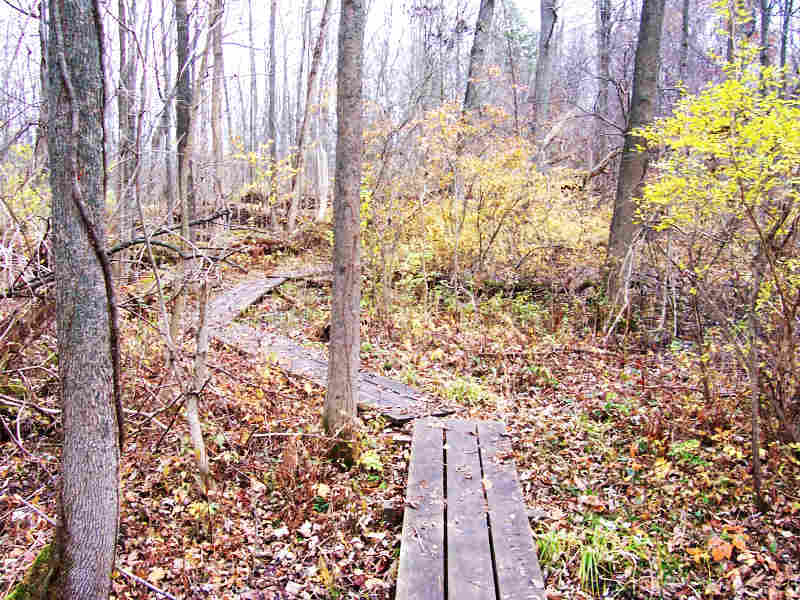 The trail surface is grass, dirt, boardwalk, and (after wet weather) can be muddy in places. It crosses streams on bridges several places. A part of it is shared with the Trolley Trail. There are several connections to the Auburn Trail. In the lowlands this trail passes through what was in the mid 20th century, the Victor Village dump. Debris may be sighted. In May '11 about 500-feet of boardwalk were constructed through the wettest areas in this section by VHT volunteers with help from the Victor High School Track Team. Other boardwalk sections have been constructed as Scout projects and by VHT volunteers. This is full multi-use trail. At Rawson Rd, the Auburn Trail turns off to the left on the sidewalk. The Seneca Trail continues straight on the multi-use surface to School St. Here the trail begins as though it were part of the Auburn Trail (made in conjunction with the adjacent developer), then is again foot-path on a dirt and grass surface. Mostly meadow in this section. Here we see something unusual: a stairway! At the bottom is a a sharp turn where it crosses Great Brook. The bridge over Great Brook has been known to wash out in spring flood. The Seneca Trail passes the RG&E sub-station and crosses Dryer Rd as it continues south. 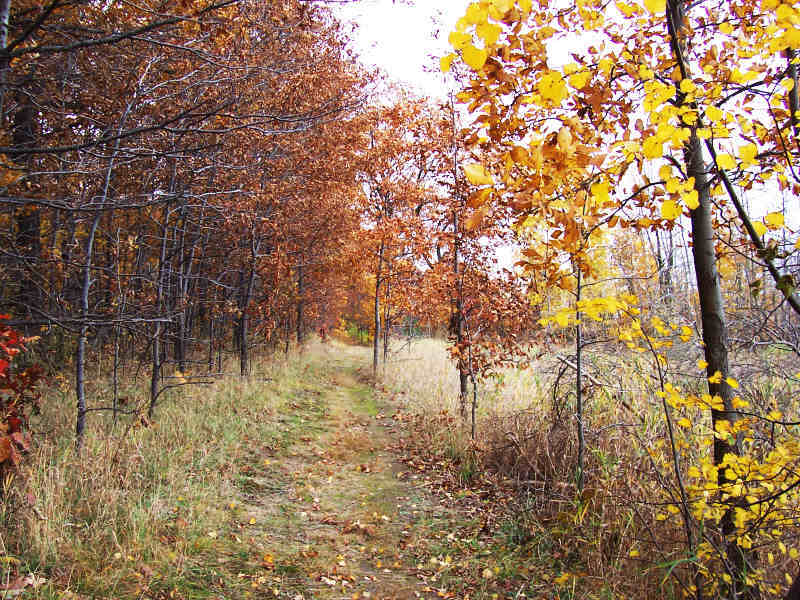 This dirt and grass surfaced trail is 2- to 3-feet wide through woods and over hills. It has a short step section as it crosses a driveway. The Seneca Trail crosses School Rd. Here the blue blazed trail to Fort Hill and Dryer Rd. Park goes straight west. The Seneca Trail turns along the roadside of School Rd. and then west on Boughton Hill Rd. to the first driveway to the south. There is parking off of Boughton Hill Rd. The trail begins along the "farm driveway" and passes the large metal barn. It then enters meadow and woodland. The surface is grass and dirt. This section parallels Great Brook for a way and is one of the prettiest trail sections. The bridge was constructed in the summer of '07 with lots of help from the Apple Farm. The Seneca Trail makes a sharp right uphill turn to continue along the brook. The yellow-blazed Apple Farm Trail continues straight off the bridge to The Apple Farm, its Store, and parking lot on the Victor-Bloomfield Rd (NY444). This is wide farm driveway through meadows and orchards, with a surface mostly of grass. See the description for the Apple Farm Trail. Caution: This section may be shared with equestrians. Horses have the right of way. If you approach from the rear, be sure to make “human” noises soon enough not to scare the horse or rider. Caution: This is also private hunting grounds. 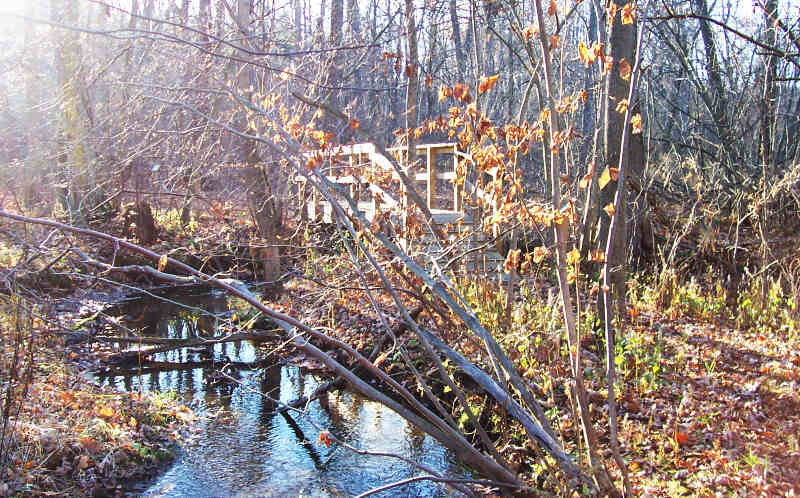 The trail is CLOSED in the fall and spring hunting seasons for your safety and at the landowner's request. See http://www.dec.ny.gov/outdoor/65231.html for current hunting season information. 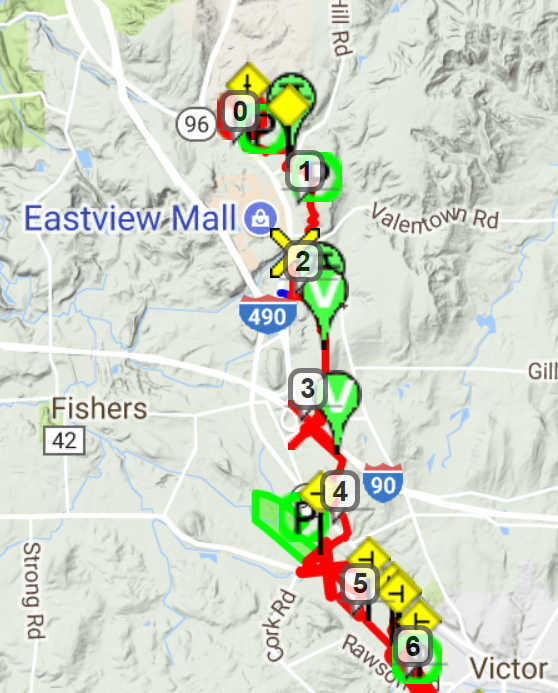 Caution: There are also several private trails intersecting. Please stay on the marked Seneca Trail and respect the landowners rights. It is the landowners continuing cooperation that makes it possible to have a publicly accessible trail. There is no public access to, or parking for, the trail from Cherry St. 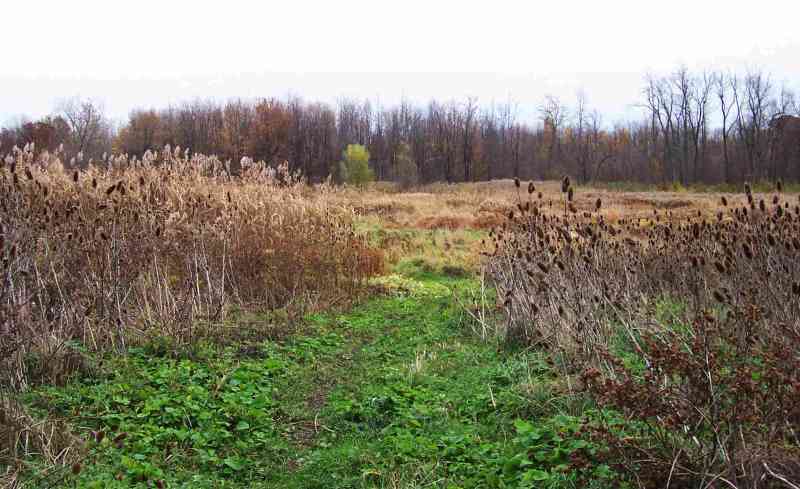 The Seneca trail continues through active farms, woods, and meadows. There is a temporary narrow plank bridge at Great Brook. A permanent bridge is in the planning phase. The trail connects with the trail system in Boughton Park. Just into the park, the Seneca Trail turns south at a junction of park Trails. The red blazes mark the way. Also at this junction is the blue blazed alternative trail that goes to the Sternie Rd. parking lot on the west side of the park then along the West Pond to the Boughton Road parking lot. The only other place of potential confusion is at the top of the dam where the Seneca Trail makes a U-turn while a park trail continues straight ahead. The Seneca Trail continues down the east side of East Pond to the Boughton Rd. parking lot. Boughton Park parking in both lots is restricted to residents and tax payers of the towns of Victor, East Bloomfield, and West Bloomfield. Parking permits are REQUIRED and available for free at the three town halls. Tickets are issued and/or cars are towed. Permanent bridges are needed by Valentown, in Ganondagan and just north of Boughton Parks. These will be built as funds and volunteer time become available. Way out dream: That VHT's Seneca trail be part of a network of trails from Irondequoit Bay all they way to the Finger Lakes Trail system. The FLT currently has a branch that comes up to the Bristol Hills.